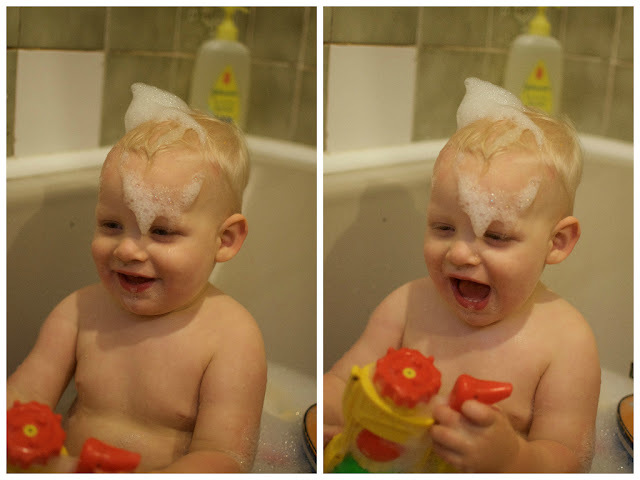 As a stay at home mum, if you were to ask me what my favourite part of the day was my answer would always be bath time! 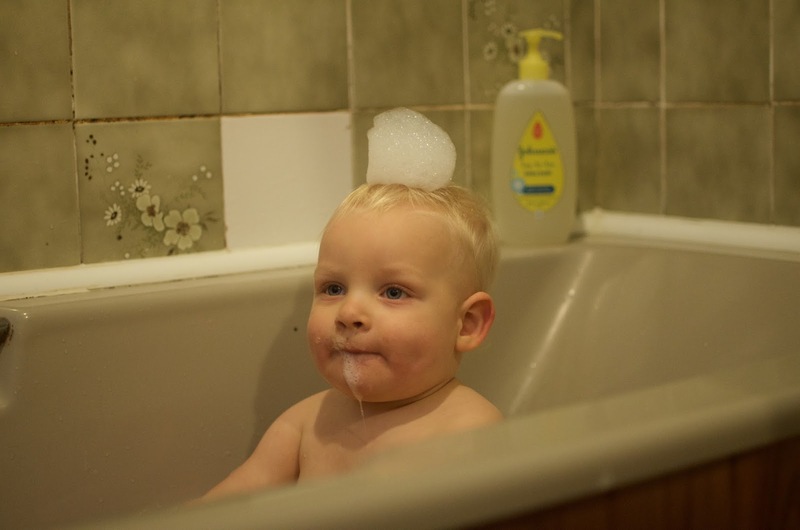 Right from when Alice was a tiny little baby, she always enjoyed her baths, and Thomas is no exception. The second my children's little ears hear the sound of the water turning on, they jump about with excitement and can't wait to get in! I thought I would share my 3 top tips for the perfect, before bed bath time! 1. Bubbles! The more the merrier. Johnson's top-to-toe baby bath is clinically proven to be as safe and mild as water for newborns and is a firm favourite of ours! Squirt a little (or a lot) as the water is running and swish it about for maximum results! It honestly smells amazing and makes pretty sweet bubble hats! I find that Thomas gets so excited when he sees all the bubbles and immediately squishes them in his hands until they pop! 2. Toys! The favourite toys in this house are ones which create a splash, and more bubbles! Anything that can have water poured out of, ducks which create a big splash when dropped or... the water gun! I do find that less is more when it comes to toys though. My two children are so happy to simply splash around with the bubbles that toys often get in the way, especially as there's not much room with two of them in there! 3. Baby massage. This is something I've incorporated into Thomas's bedtime routine quite recently, and we are loving it. After snuggling him up in a big cosy towel on my bed, I use Johnson's baby oil, which is ideal for baby massage! I think the best bit about this new little addition to our routine, is the extra time we get to spend together before bed. It's a lovely way of just, calming Thomas down for sleep time (always a good thing) and strengthening our bond with one another. One little tip for this that I had to learn the hard way, is to make sure you put a nappy on BEFORE massage time! Eek! The reason I love bath time so much, is because my children love it! I think bath time is such a fun, happy, calm time and I love spending that quality time with them, doing something we all enjoy before they go to bed. I'm still fairly new to baby massage, but so far I think it's really helped to calm Thomas down before bed. I really love having that time with him before he goes down for the night and I honestly believe he does too! JOHNSON’S® understands that babies skin is so delicate it needs extra special and gentle care. That’s why, for almost 120 years, JOHNSON’S® has been helping parents take the best care for their babies’ skin. JOHNSON’S® brand believes that giving your baby a massage after bath means for more smiles, more eye contact and more gurgles. That’s because your touch creates sensations that stimulate baby’s brain. So massaging with JOHNSON’S® baby oil after bath time doesn’t just moisturise and protect baby’s delicate skin, it can also help support happy, healthy baby development. Discover more at http://www.johnsonsbaby.co.uk/sensorial-experiences. I love your baby so much. Did you find a great stroller for your baby ?